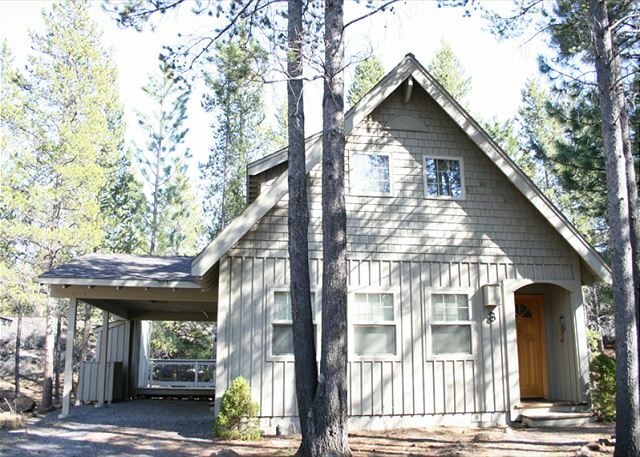 Stay in a 2 bedroom exceptional vacation home when you getaway to Sunriver! Invite up to 6 guests…don’t forget your four legged best friend! When you walk inside Timber #8 the living room is on the left and provides a gas fireplace. Gather with loved ones as you warm up in front of the fireplace or watch your favorite movies using the DVD player. The well stocked kitchen with convenient island overlooks the dining area that leads to the private deck. Take the spiral staircase to the upper level to the 2 bedrooms with a King or Queen bed. The 2 bedrooms provide a private vanity area with a jack and jill bathroom. The bedrooms are charming with its detailed Victorian inspired décor. We had a great time summer time vacation in Sunriver. The house was perfect for a family of 3-4. The house was very clean and well organized. Although small the layout is such that we never felt crowded. The kitchen is well stocked with utensils compact and easy to work in. The back deck and hot tube was large and somewhat prsomewhat private. The upstairs beds are newer and comfortable and the ceilings are vaulted. There are plenty of windows which helped with natural lighting and quickly cooling down the place at night after hot 90+ days. The train tracks are near by but the house sits lower than them so we heard the trains once or twice during the week when we had the windows open all night. We could easily bike to fort rock park and the village in about 10 minutes. Thank You for the 5 star Review, Collin! It sounds like you had a fabulous time at Timber 8 and enjoyed the layout, location and hot tub! Come back soon! Excellent smaller home close to SHARC and Fort Rock Park. Two adults and our 9 and 6 year old children had a wonderful time. As always, the home was clean and well equipped for living. We prepare almost all meals at the rental and appreciate the kitchen and grill. The hot tub was a great hit with kids. We enjoyed a little rafting on Deschutes through Sunriver and the SHARC passes allowed us to use the boat launches. Great stay. We will be back. Thank You for the 5 star Review, Sheridan! It sounds like you had a wonderful time enjoying all of the Sunriver activities! We hope to see you again! This is a nice small home that was the perfect size for the 3 of us. The laundry dryer did not work and the upstairs had not been vacuumed. The kitchen was well stocked and the home was comfortable. We would consider staying there again. Thank You for your review! We are glad to hear that you enjoyed Timber 8! We will have our maintenance check/fix the dryer and housekeeping has been notified about the vacuuming that you mentioned. We hope to see you again! My son and I loved the stay. The wedding and reunion was great. Wish parking was better but we made it work. Thanks so much for the review Vicki! We hope the wedding was fantastic! Had a nice time, house was very clean, comfortable and convenient to road to town. Best hot tub we've had at Sunriver. Spiral staircase kind of a pain but probably very good for kids. Reservations excellent. We've been using Sunset lodging for 10+ years, always excellent. Thank you for your feedback! Timber 8 is one of our most popular cabins and we are so glad you enjoyed it! We hope to see you back in Sunriver soon and thanks kindly for taking the time to review Sunset Lodging and Timber 8. Perfect. We loved our little cabin in the woods. Clean, private, excellent floor plan, back deck for coffee and/or dinner. The BBQ was low on propane and the property management company responded almost immediately with a replacement. The property is very close to the Village, the SHARC and the highway. We will absolutely be back!! Timber 8 was the perfect house for our family vacation. All the living space was downstairs. Plenty of room to relax (the sofas are new and very comfortable! ), prepare meals (great kitchen with forest view) and big eating area. It was nice to have the 2 spacious rooms with lots of storage (and hiding places for the kids) upstairs. The Jack & Jill bathroom worked great for us. There is a somewhat small spiral staircase up, but wasn't an issue for us. The hot tub was big and so relaxing after a day of exploring or for one more dip after a day or evening at thec SHARC. THE SHARC passes allowed us to park down by the river to tube as well. We would definitely go back and Timber 8 would be great. Excellent location too. The train was loud the first time we heard it and then we didn't really notice or mind and it was fun to watch each day. Wow Robin, thanks kindly for this great feedback on Timber 8! We are so pleased that it worked well for your visit and we hope to get the chance to host you again and again here in Sunriver. Had a very relaxing time. Especially enjoyed the hot tub with all the snow. We really aprpeciated having unlimited SHARC passes! we are all about the water activities ,so that was big.The beds were not the most comfortable,but that was really my only suggestion for improvement.Overall a good time. We had no idea what to expect when we arrived, but we were very surprised to find a very clean nice home. We had a great stay and even extended it another day. Nothing like a bonus vacation day!! So glad you had time to spend with us this summer, Erin. Please hurry back to Sunriver! We loved it! It was just the two of us and our dog. It was clean, comfortable, cozy, loved the deck and hot tub! They didn't include bikes but upon arriving they were able to get some for us for our entire stay. Staff was very easy to work with and friendly. Thank you for your feedback on your Sunset Lodging experience! We are happy to see that you were comfortable and enjoyed the interactions with our staff! Please keep us in mind for your future vacation planning! We are glad you liked Timber #8. I am sorry to hear the floors were not clean. We here at Sunset Lodging hope to see you again soon.